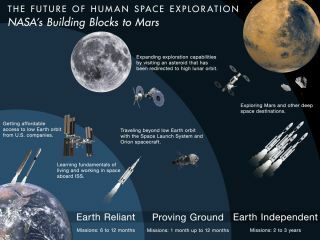 NASA's building blocks for a mission to Mars encompass a series of missions that will expand U.S. space capabilities to the point where humans can safely travel to the Red Planet. Today, NASA is working with commercial partners to obtain affordable access to low Earth orbit from U.S. companies and learning the fundamentals of living and working in space about the International Space Station. NASA will begin travelling beyond Earth orbit in September 2014 with the first flight of the Orion spacecraft, then in a few years redirect an asteroid to high lunar orbit for scientific studies. Earth independent missions, such as flying humans to Mars, are expected in the 2030s. Image released March 4, 2014. NASA unveiled its 2015 budget request on Tuesday (March 4), a $17.5 billion spending plan that would maintain the space agency's major ongoing missions, while supporting ambitious new science missions and making cuts to others. This budget keeps us on the same, steady path we have been following — a stepping stone approach to send humans to Mars in the 2030s. It's a path that has seen many recent successes, from the launch of the Global Precipitation Measurement mission last week — the first of an unprecedented five Earth Science launches this year — to returning space station resupply missions to U.S. soil with private American companies …to the power-up of Orion and the countdown toward its first flight test later this year …to the final mirrors for the James Webb Space Telescope being delivered. This budget ensures that the United States will remain the world's leader in space exploration and scientific discovery for years to come. The budget supports the administration’s commitment that NASA be a catalyst for the growth of a vibrant American commercial space industry, and keeps us on target to launch American astronauts from right here in the USA by 2017, ending our reliance on others to get into space and freeing us up to carry out even more ambitious missions beyond low-Earth orbit. Read NASA chief Charles Bolden's full statement on the 2015 budget request here. With the proposed budget, the Administration continues to communicate the importance of having a strong national space program that can further our presence in space and benefit life here on Earth. We applaud the robust support for Commercial Crew and Space Technology which will strengthen our space industrial base, and secure the nation’s place as a leader of exploration and innovation. We look forward to working with Congress to achieve the highest levels of funding for these critical programs. The budget proposal for planetary science is significantly better than in past years, but is still far below the levels approved by Congress and isn’t sufficient to meet the priorities laid out in the decadal survey – which put the highest priorities on Mars 2020, a Europa flagship mission, and the Discovery and New Frontiers missions. While I’m pleased to see the budget continues to provide funding for the Mars Exploration Program, in particular the Mars 2020 mission, and recognizes the importance of a future mission to Europa, a far greater investment will be necessary to ensure America’s preeminence in planetary science. The Administration should recommit to keeping the Mars 2020 project on track and on time, and to a far-reaching Europa mission. Thanks to the brilliant scientists at JPL, we have the unique ability to design, fly and land sophisticated robots on our planetary neighbors – and if these projects are disrupted, we might lose this perishable and incredibly specialized talent pool. America’s leadership on planetary science is not something we should surrender, and is something that my colleagues on the House Appropriations Committee have supported repeatedly. I look forward to working with my colleagues, once again, to restore adequate funding to planetary science and only wish it wasn’t necessary to do so year after year. The president's proposal of $17.46 billion in FY15 funding for NASA is very close to the FY14 appropriation of $17.64 billion. Additional NASA funding proposed within the Opportunity, Growth and Security Initiative would increase NASA's FY15 funding to $18.4 billion. With NASA's budget at a historic low as a percentage of the federal budget, we strongly support the $18.4 billion proposal as a bare minimum. The increase of funding for commercial crew programs from $696 million in FY14 to $848 million in FY15 could not come at a better time. Soyuz prices are set to increase yet again, and our dependence upon Russia for key space capabilities is certain to be scrutinized in view of world events. All International Space Station budget lines would be fully funded, which is important to sustaining ISS operations to 2024. Overall, the President’s budget request is a realistic, yet bold plan for action. I look forward to further examining the proposals in the President's budget that fall under the jurisdiction of the Committee on Science, Space, and Technology. The future of American innovation and leadership rest on the investments we make today. In that regard, I am happy to see the Administration take a more deliberative and transparent approach to our nation's STEM education efforts. Preparing our next generation for the jobs of tomorrow should be our top priority. Budget increases for some agencies and programs will help maintain U.S. leadership in science and innovation. However, I am disappointed to see flat or even decreased funding in a number of key areas of the federal government's R&D budget. For example, the budget request for the National Aeronautics and Space Administration fails to even meet the 2014 enacted funding level and, if enacted, will hinder the agency’s performance in the coming years. To provide for additional investments, the President included a proposal to Congress titled "Opportunity, Growth and Security Initiative." I support the goal of increasing our investments in R&D STEM education and I hope to work with the President and my colleagues to further clean energy technologies and grid modernization, as well as advanced manufacturing initiatives and research on the impacts of climate change.